A guy I met told me visiting Alaska was the trip of a lifetime. I hadn’t thought of it that way. The trip of a lifetime, I thought, should be someplace incredibly exotic –like Timbuktu, or Kashmir. Alaska, after all, is one of the 50 states. But the guy was right: It is the trip of a lifetime. You can fly to Alaska. Easy. You can drive. Not so easy. But the best way is by boat –up the Pacific inland waterway. A thousand miles of gliding between dark forested mountains that have never known the step of man. Whales and porpoises swim up to the ship, curious, unafraid. Bears come down to the water’s edge to catch fish. 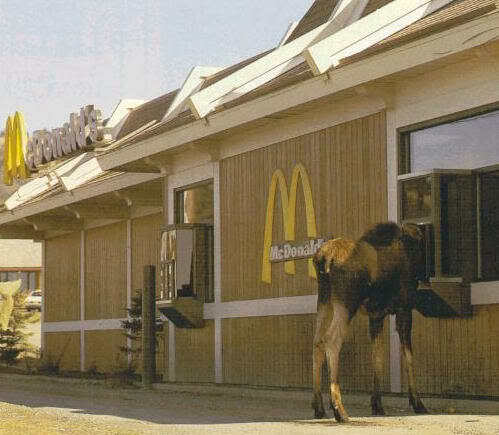 Moose stop grazing to look. The sea is as still as a pond. A 10-day tour by ship costs about $1,200-$2,200 per person, depending on cabin size and location. Not as bad as it first appears, really, since it includes your room, entertainment and all meals. Sometimes you can get discounted tickets just before a ship sails. Ships leave from San Francisco, Seattle and Vancouver. There are several lines: Norwegian, Holland/American, Cunard, Carnival, etc. The young and adventurous can take passage on a mail boast if they’re willing to sleep on deck and bring sandwiches. Not many people know about these. They leave every couple of days from San Francisco and Seattle, and the price is very cheap —$40 or so, depending on how far you’re going. First port heading north. It is cold, gray and wet. It does not snow much in Ketchikan, but it rains all the time. The playgrounds of the public school yards are all paved; otherwise the children would be playing in mud. They are roofed too. The town is built so steeply into a mountainside that part of the main street is on stilts. There are streams all over, and salmon swim through town on their way to spawn. Ketchikan has 9,000 people, or so the atlas says. There is a drugstore and a movie theater. There is no way in or out except by boat or seaplane. It is Alaska’s fourth-largest city. There is no place quite like this one, and perhaps there never has been. Skagway was the gateway to the Yukon Territory during the gold rush at the turn of the century. Fortune hunters and adventurers from half the world arrived here by boat and began the walk to Whitehorse and Dawson City, 500 miles to the north. It was the easiest way in. By 1890, Skagway had a population of 20-30,000 — no one is quite sure. By all accounts every rip-roaring, free-swinging, saloon and dance-hall town you ever saw in the movies was nothing compared to this place. Author Jack London said it was the hardest, toughest, most lawless place on the continent, which was really saying something at the time. The town is at the northern end of a hundred-mile-long fjord. It has about 700 people year-round, though that swells to almost a thousand in the summertime. They paved the main street last year, a source of much local pride. The sidewalks are still wood. In the Red Onion Saloon in the center of Skagway the only patrons were two men about the size of trees and one of the most beautiful girls I have ever seen. One man was in a full body cast. He had just gotten out of the hospital, it turned out, mauled by a grizzly bear. He was walking in the woods near his house when he saw the bear. The bear saw him too. At first the bear didn’t do anything. Then it charged. Bears are very territorial and this was the bear’s territory. The man ran then and climbed a tree, because no matter how big you are, you are not as big as a grizzly bear. Climbing the tree turned out to be a mistake. The bear reached up and with one paw brushed him out like a bug, and he landed 20 feet away in a creek bed, with a broken leg and shoulder. The bear came and stood over him then, and after looking at the man for a minute, took his head in its jaws and bit, fracturing his skull in several places. Then the bear shook itself and walked away. The man the size of a tree explained all this the way you or I would talk about a traffic accident– just a kind of mishap, you might say, on the way down to the grocery store. Half the people in the state live here. There is a Hilton, owned by Walter Hickel, the former governor and U.S. secretary of the interior. The most interesting thing about Anchorage is the suburb of Hope, about three miles away across an inlet cut by a glacier. That three miles is all quicksand. To get to Anchorage from Hope you have to drive around the glacier, about 200 miles. The interior. Even when it’s warm, it’s cold in Fairbanks. The most interesting thing about Fairbanks was watching a construction crew putting in sewer lines for a new housing project. They blast the trenches out with dynamite. This is the permafrost; digging is out of the question. The Indian name for what we used to call Mount McKinley, at more than 20,000 feet the highest point in the North America. Denali means “the big one.” The park is 5.7 million acres. Dawn and a cold wind blowing off the mountain. Fifty to sixty bighorn sheep grazing part-way up the side. Though they are only about a mile away, that mile is almost straight up, and it would take all day to reach them. About a hundred yards away, a grizzly is eating some berries off a bush. grass and ringed by low peaks. It is totally desolate and incredibly beautiful. An eagle takes flight from a crag a quarter mile away. You can hear the beat of its wings. The capital. In his book about Alaska, “Going to Extremes,” Joe McGinniss writes that Juneau is so mind-numbingly boring that lawmakers regularly snort cocaine in the caucus rooms when the Legislature is in session. I believe it. You can walk the whole city in a couple of hours. Take a bus and you can cover the suburbs in 20 minutes. The bus line ends at the Mendenhall Glacier. If you stand there you will hear sounds like distant cannon fire. It is the ice cracking as the glacier moves. It is June and nearly 60 degrees in downtown Juneau, so warm that several young ladies have taken advantage of the heat wave to dress in shorts and halter tops. No one else considers this odd. Nothing is considered odd. In the Ace Hardware store downtown they sell Uzi submachine guns in the sporting goods department. 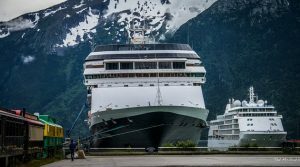 Juneau is built against the side of a 2,000-foot cliff. It is beautiful almost beyond belief.